Posted June 1st, 2018 by Sports Afield & filed under News. 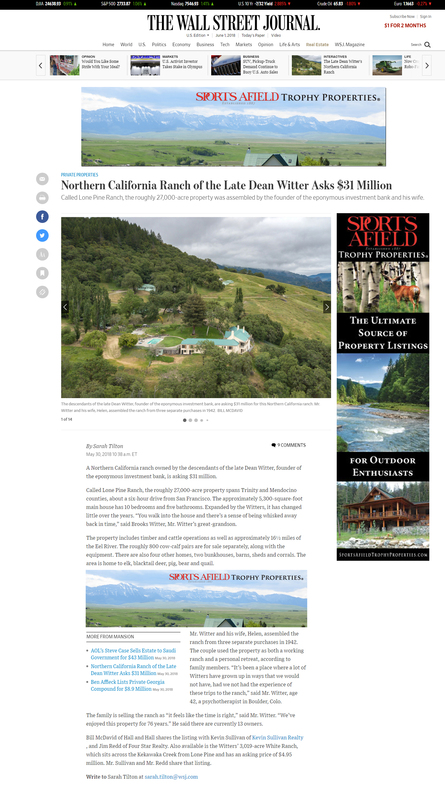 A beautiful 27,000-acre ranch in northern California once owned by the late Dean Witter, founder of the famed investment bank Dean Witter & Company, is on the market with an asking price of $31 million. Sports Afield Trophy Properties brokers Kevin Sullivan of Kevin Sullivan Realty and Jim Redd of Four Star Realty, also known as The Ranch Specialists, share the listing with Bill McDavid of Hall and Hall. Lone Pine Ranch, located in Trinity and Mendocino counties about six hours north of San Francisco, is currently owned by thirteen of Witter’s descendants. The property has been in the family for seventy-six years, ever since Witter and his wife, Helen, purchased three separate adjoining ranches in 1942 to create Lone Pine. It was both a working ranch and a personal retreat for the couple. The ranch features a 5,300-square-foot main house with ten bedrooms and five bathrooms. There are four additional houses and two bunkhouses as well as barns, sheds, and corrals. It is a working cattle ranch with 800 cow/calf pairs for sale separately, and the ranch has timber and encompasses more than sixteen miles of the Eel River. Elk, black-tailed deer, wild pigs, bears, and quail frequent the property. A smaller property, the Witters’ 3,019-acre White Ranch, is also for sale for $4.95 million. Kevin Sullivan and Jim Redd share the listing for this property, which is located across Kekawaka Creek from Lone Pine. For more information about Lone Pine Ranch and other Trophy Properties from The Ranch Specialists, visit sportsafieldtrophyproperties.com.